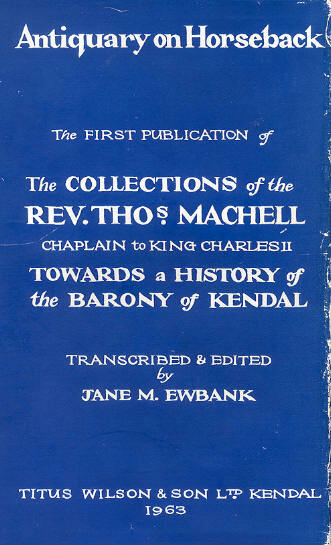 Thomas Machell was Rector of Kirkby Thore in Cumbria, England, from 15 August 1677. When he was buried on 12 November 1698 he left behind six large manuscripts of notes towards a history of Cumberland and Westmorland. This information was gathered at first hand by visiting each village in turn and making notes and sketches of the things that interested him. In 1678 he paid a visit to Burton-in-Kendal, but it was another thirteen years before he added very much more to his “collections” about the Barony of Kendal. In October 1691 he crossed the mountains and made a short tour on horseback visiting Natland, Crook, Underbarrow and Winster. He must have been encouraged by the information he gathered, for the next year he spent a month – from 5 July to 2 August – touring the length and breadth of the Barony on horseback, keeping a journal of his travels, writing copious notes, and making sketches. He returned in March 1693 to see, amongst other things, the Chapel at Ings and to copy the Benson family emblem at Coat How near Rydal. Unfortunately he died before he had time to organise the notes or make fair copies. He left them in his Will trusting that they would be ordered and printed. However, they were found to be “so imperfect, raw and undigested that ‘twas impossible to bring them (of ‘emselves) to any such account as the good man hoped for”. Therefore the notes were bound and presented to the Dean and Chapter Library at Carlisle Cathedral. It is remarkable that such a rich source of information lay unprinted and largely unused by historians for so long. Perhaps this was due to the fact that Machell’s handwriting is not easy to decipher, and the notes are full of abbreviations and strange spellings. In many places original observations are crossed out and second thoughts written on top. However the difficulty of reading the manuscript was eventually overcome by Jane M Ewbank, a member of the Cumberland and Westmorland Antiquarian and Archaeological Society. She transcribed the notes and added text to help the sentences flow more easily, (these are represented by italics found in square brackets). Illustrations were also traced from the originals. This work was published by Titus Wilson & Son, Kendal, in 1963. A number of copies are available at both the Kendal and Carlisle libraries..